The warm sun shone through the nursery window as I rocked my 5 day old in a plush aqua colored glider. I had rocked in that chair for weeks before my son arrived hoping he might become accustomed to the feel of it. I thought that maybe if he got used the gliding motion while he was in my belly, he might fall asleep easier when he was in my arms. Oh the ways that I had prepared for that sweet boy. Stillness filled the house. The only sounds that could be heard were the whispered drips of melting ice outside of the nursery window. A massive Christmas Eve snow storm a week earlier had brought feet of snow, but the warm sun was making progress to melt what remained. As I sat there rocking my sweet boy, I closed my eyes and hoped that the sun would do the same for me…. I hoped that it would melt away the mountain of fears that consumed my heart. *swish swoosh swish swoosh* the chair swayed back and forth keeping time with the drips. It was the middle of the afternoon, the baby was asleep, and I began to cry. At my baby shower, I received closets full of clothes and endless piles of diapers. I had every cream, lotion and soap an infant might need. I had received books and blankets and bottles and binkies …. And lots of advice. There was certainly tons of free advice! Mommy veterans – some who had become mothers 5 times over – made sure to tell me which diapers were the best, which bottles didn’t lead to gas, and which onesies were the easiest for middle of the night diaper changes. I tried to remember all of it as I registered. But the one thing I needed the most was not found alongside the adorable hats or baby slippers on the shelves of Target. The one thing that would prepare me the most for mommy hood was a moment of honesty and a few simple truths spoken to my heart. Sweet girl, there will be days when you are terrified. There will be days when you have no idea what you are doing or who said it was a good idea for you to be responsible for this precious little life… But it’s going to be okay. There will be days full of doubt. You will doubt yourself and you will doubt your decisions. You will seriously doubt that you will be completely confident ever again… but it is going to be okay. 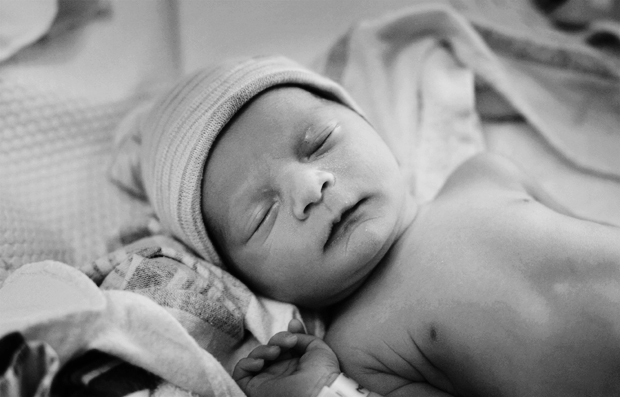 The lack of sleep and stress and fussiness of that precious little baby in your belly (soon to be in your arms) will be more than you can handle some days. I promise, sweet girl, it will be okay. You will worry that you are doing it all wrong. You will worry if the baby is eating or sleeping or breathing. You will check and recheck and triple check to make sure that the baby is eating and sleeping and breathing. They are. They are going to be okay. It might take weeks or months or maybe even years for you to figure out this mommying thing… but it’s going to be okay. The baby is going to be okay. You are going to be okay. You are going to do a great job. Not because you picked the right diapers or the best bottles… Not because you are going to breast feed or bottle feed… Not because you are going to wear your baby or put your baby in a swing… But because you are the best mommy for the job and that is exactly why God chose you! These days will not last forever, sweet love. You won’t always feel overwhelmed. You will look around one day as you make dinner with one arm and a baby in the other and think… I’m doing it! You will take a shower and peek out over and over at the sleeping baby strapped into the swing pulled into the bathroom and think …. I can do this! You will make your way to the crib and scoop up your baby in the middle of the night and the routine will be familiar and the results will be the same and you will lay that sweet baby back into their bed and realize… You are making it. Because just as the sun melts away the snow, fear gives way to hope. The Son will warm and fill your heart. He will not leave you. He promises to shine light into the dark fearful places and bring assurance and peace. He will bring confidence. He will bring joy. Because even though there will be days that you do not feel like it, you’re going to be okay, mom. You will not be doing it alone. 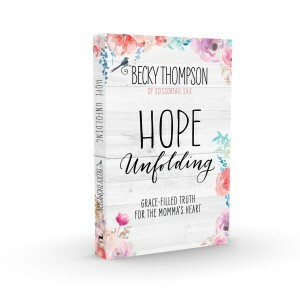 Whether you are a new momma or a seasoned momma, if you enjoyed this post, I promise you will be encouraged by my new book Hope Unfolding: Grace-Filled Truth for the Momma’s Heart. I would love to connect with you via Facebook. I try and stay in touch with my readers on a personal level through social media. Share this post to pass it on, and then to follow me on Facebook, simply click here. this is said so beautiful… and is sooo true i just had a baby by last November and can really resonate. thank you for writing! I have a 3-year-old at home and one in the belly due in June… and I’m in tears. I really needed to read this as worry is taking over. Thank you! Beautifully done! Beautiful words even for mommies with eight-year old children! Thanks for the gentle reminders that God is, always was, and always will be there for us! I’m expecting my first baby in September. I am already feeling all of those fears. Thank you for this. I am going to bookmark it and come back to it on those days when my heart is overwhelmed. I enjoy reading your posts, no matter what the subject. We have 3 children who are now 20, 18 & 15. None of which were planned, but all wanted very much. My cousin said once when you have kids you throw life up in the air and let it land where it lands…and with the first 2 I thought “I must really have this under control cause it really isn’t that bad.” Then along came number 3. I was suddenly out numbered. Of course the 3rd was a girl who was pretty sure she couldn’t live without sights on mom. I remember the first day my husband went back to work for a full day. At 11 o’clock in the morning I was still in pajamas, hadn’t brushed my hair or teeth, and the boys were hungry. I wasn’t sure this was going to work…mom did this with 4 of us. How come i can’t handle 3 and I sat on the couch in tears. Have confidence in your ability to be a mom. Know there will be days where nothing will get done other than breakfast, lunch and dinner. You might set on the couch all day in your pajamas with the kids in their pajamas. I promise, they will pass and way too fast…way, way too fast, so enjoy every minute of it. That was really beautiful. It was so relieving to know that some of the feelings and stress i feel at times, is shared alike with others. It gives me a sense of feeling normal. That you for that piece, it was very refreshing to read. Children are awesome gifts from God and He won’t give you anything you can’t handle with Him! So beautifully written and never truer words spoken! I have just stumbled across your blog and wished like crazy I had this as I began my life journey 28 years ago with my oldest! Now, with my youngest,9 years, and the baby of 7 children, I feel as though I am still learning every day to be a better Mommma! I have found that when I “Let Go and Let God” everything is alright and actually more exciting! I still worry, still cry, still laugh, still take pictures like crazy for those “first time he/she ever….” because I am and will forever be Mom. I role in which I treasure and am humbled each and every day to carry out. And as I slow down in the lull of time between parent and grandparent, I pray that my eyes will always stay open to the beauty of each day and the things that really matter! May God bless you on your family journey and that you have FUN every day! I am a 66 year old grandmother now after having four boys of my own. The days were crazy sometimes. But when you look back, all you remember are the good times and wish you had left the house dirty and the floors unmopped and spent more time with those precious little ones. To all the new mothers out there: treasure that time with your children, rock the baby all night if you want too, they grow up so very fast!! One day they are babies in your arms, the next grown with children of their own!!! This had me in tears. Written so well, and much needed. My baby is 4 months old, but I still have those days… Thank you for the encouragement. Such appropriate words even for a mom of a 12yo & 16yo. We homeschool and I’m constantly talking myself off the ledge of hysteria over “am I teaching the right things? Will they get into college? Am I ruining their life? !” So thankful for the little reminders here and there that GOD IS IN CONTROL so I don’t have to be…because I’d mess it up! I really needed to read this. I had a baby a month back and its so overwhelming and scary when another life depends on you. Love your posts. overwhelming some days. Thanks again and God bless you. I remember putting my son in his car seat and setting him in the doorway of the bathroom so I could shower. I remember laying my daughter down the first night we were home. I woke up in a panic 6 hours later, thinking that she had woken up and I didn’t here her. She was sleeping,”like a baby”. My son will be 29 in Aug. and my daughter, 20 in July. They are still OK, Thank you God. I SO needed this today! I am 18 weeks and, after registering for baby stuff yesterday (and holy cow, how overwhelming is that in itself?? ), I didn’t sleep well last night and was having a sort of freak out this morning. I know that this baby boy inside of me is what I want and I know deep down that I will be a good mommy, if only because he will be SO loved. But it’s still terrifying at moments. So thank you for this! As I sit nursing my little girl in the middle of another sleepless night, I have to say thank you. This was exactly what I needed! I am a mother of 3 amazing boys…6 years, 4 years & 3 months. I felt like I was just getting the hang of the whole ‘managing two’ thing when one day…surprise…we found out we were expecting the third. I was filled with so much emotion and doubt and thoughts of ‘how am I going to do this’. Now that my little Matthew (meaning: Gift from God) has made his way into this world, I think to myself ‘I’m doing it’ and ‘How did I ever survive without him’! This is so true and beautifully written! Thank you for sharing! Thank you for this post! But really, thank you for ALL of your posts. My little girl just turned 3 months old, and I had no idea that I would be so in love with motherhood and overwhelmed with motherhood at the same time. This was encouraging to my heart and brought tears to my eyes, just to know that I am not alone and that it really will be okay. So, thank you. 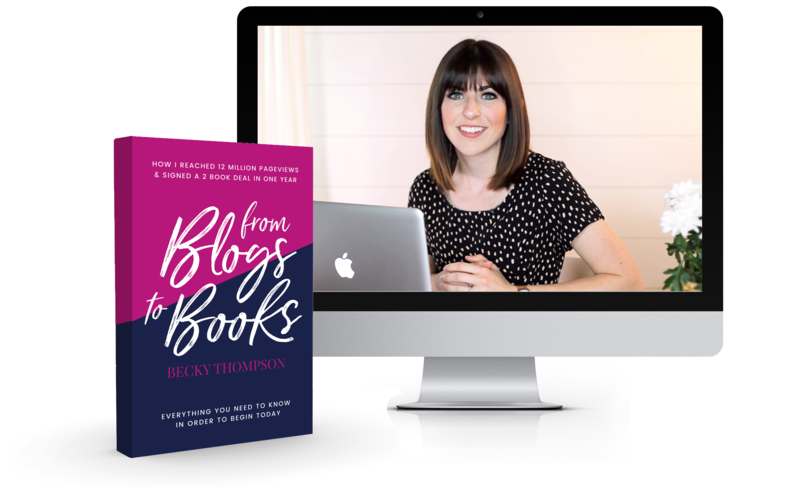 I wrote about your blog on my very brand new blog (http://ibecameamom.wordpress.com/2014/08/13/these-days-will-not-last-forever/), hopefully I will send some more new moms your way and they will be encouraged as well! Beautifully written, and said! Your babe is just so very sweet. Congrats! right? What was right in 1940 is different than 1950, than 1960 and so forth and so on. What is most important is the love. A dirty diaper can wait…love can’t. I am a dad. And what I have found out, most mothers forget most of what they did, even just a few months later. This generation was not raised to be mothers. Past generations girls were raised very young being taught daily how to take care of kids. We have new tools. Tons of amazing cheap cloths choices. And resources that are available 24/7. Being scared is nothing more than not having experiences. This is why there are two to help each other. I had extensive experience with kids in my life. Even I didn’t know what it was to be a dad. I had to teach my wife how to care for our child. And she somewhat hated me for it, we both had short tempers with lack of some sleep. I could not believe she didn’t know the most basic things and she didn’t care for the way that I acted like I knew everything. She had never baby sat or even cared for a child once in her life. Something I never thought about before marriage. She would ask her mom questions and her mom basicly said, I really don’t remember much of what i did. We took photos and our life went on. Our next baby came and to be very honest we had forgotten so much in just one and a half years. We forgot all the little things. Being a mom or dad with the fear and joy is just all part of growing up with your child. It is your transformation into a parent. Your job is to forget everything so your child can figure it out as well. Loved your letter, I am 78 and have 6 children, ages 42 to 60. 3 sons and 3 daughters, been married 62 years. and the first question I am going to ask GOD when I get there –Is why couldn’t he have put instructions on the bottom of the babies as to what I would need to know down the years. they could have dissolved as I finished with them and more pop up as needed. I get instructions with everything else! The baby years were bad but what about the teenage years when you love them but don’t like them. Then when they become parents and ask you for help. just tell them to talk to GOD when they get there too.. I needed this….but I’m still terrified. I’m pregnant with my first after a miscarriage, and I’ve been waiting for this my whole life. I always knew I was destined to be a mum. So why do I feel more terrified now than excited?! This pregnancy is not easy – 16wks, and morning sickness has been now termed as hyperemesis. I’m exhausted all the time and I feel like I fail as a wife more often than I succeed. How can I possibly be a good mum? I’m a new mom to be, and I just wanted to say THANK YOU for this message! I read it at work with tears streaming down my face, thinking “some gets it. Thank God.” I have so many fears about my abilities as a parent, and I really needed to hear (read) that everything will be ok. I have the sweetest little boy who is two and a brightly beautiful little girl who is almost 9 months. And the saying that they are all different is by far the truth. He was easy! She has become somewhat a challenge. There were days with him, mostly when he was sick, that I felt lost, confused, helpless. But with her, it has been the dreaded sleep. It started pretty much from the beginning. I would often cry, feel completely helpless because nothing I was doing worked to help her sleep, and not just at night but for naps. We had gotten to a point where things were working all around but then she hit 8 months. They call it the dreaded sleep regression. There are so many variables of why she is going through this. I have had many a sleepless nights lately, and I have often thought that I can’t do it. But I have had to let it go, enjoy my gifts that walk before me with smiles that light up any room. My kids mean the world to me. With even what seemed like dark days because I felt like an incompetent mom, my husband was there to say that I can do this. Their smiles meant I was doing everything possible and right. Thank you for these words. It’s nice knowing that I am not alone. I am 70 years old. I could still take a look at my 6 adult children and use the council you gave this day. As a parent I have always had times of doubt concerning my ability, times of fear concerning my decisions, times of frustration concerning my failures, times of stress concerning “stuff” and ” things”, times of guilt or doubt or longing. So far, it has all been okay. I have no reason to think that will change. Please know that your words comfort and encourage women of all ages. May God richly bless you and thank you so much! Becky, my boys are age 15, 11 and 8 and I still need to hear those words. Thank you and bless you sweet mommy friend! !